Saw this in the 2019 Schedule thread but figured a topic was appropriate. would be the rotation we'd go with to begin the season; but I do wonder if Butch plans to use Daniel as that power reliever like he did last year. Daniel was really effective in that role and I could understand not wanting to mess up a good thing there. If Wade is not Tanner Burns 2.0, Ryan Watson has some starting experience and apparently did very well this summer. Guessing we'd leave Greenhill as the closer and keep Owen in the mid-week spot. I think BT gives DD another shot at the rotation. If he scuffles again, he will switch DD to power reliever. I'd say we put Burns, then DD, then either Wade/Owen/Greenhill. I wouldn't mind putting Ryan Watson in the long reliever/spot starter role Mitchell had last year. We will need bullpen arms, and hopefully Owen/Wade, Greenhill, Watson, Anderson, and Hoerter can make up the bulk of the innings in the bullpen. Would also be nice to get solid contributions from the new guys like Kyle Gray. Probably am missing other guys. We probably may see Schilleci in the midweek games a lot more. I just don't want another Coker overuse situation like last year. Saw this on Twitter today. Not a bad collection of arms! 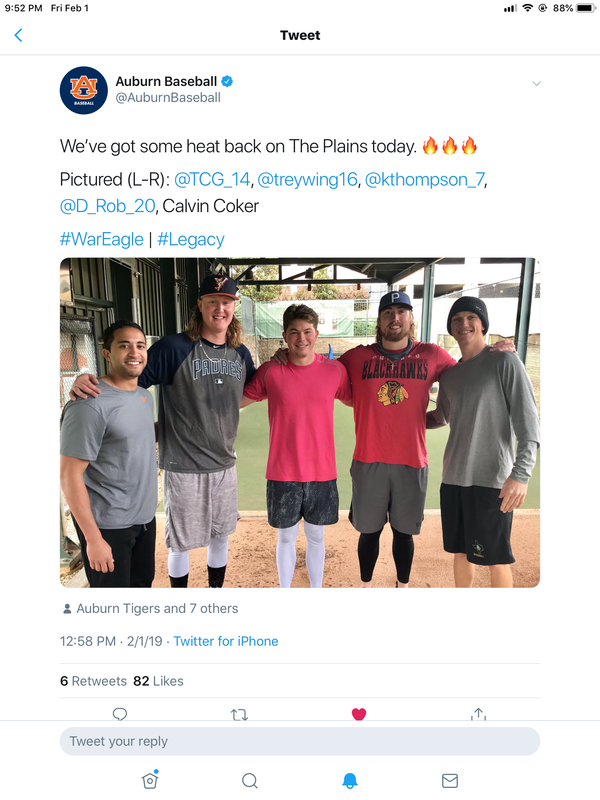 I think it’s really cool how the former players that have moved onto the professional ranks, are welcomed with open arms and have access to the staff, facilities, etc. Probably a good resource for Butch and program to have them around for the current players to see how they workout or ask questions. DD came on strong last year when they simplified his pitching options...."just go in there and throw fast ball strikes".... If he can do that again this year for give or take 5 innings, he could be on either end of a game IMO. Coach Thompson has been aggressive in pursuing former players to get involved and be around any time. He has also been amazing in his support of the guys who are on the road to the bigs. He's sent several texts over the last couple of years that allowed the old guys to get involved...had a chance to send Wingenter a message when he got called up last summer. DD to start Friday, Burns Sat and Gray Sun. I am Soooooo pumped I can’t hardly wait for Friday!!!!! Is this announced? DD on Friday over Burns is interesting, although it’s not rare to see teams hold their ace until game 2 so they don’t go against other team’s aces. Gray filling out Sunday would be nice too. I guess if that’s the case, then Jack Owen gets the nod for the midweek games. Our bullpen could have lots of options. Thanks! Good read! Excited for the season! 10 lefties on the pitching staff...finally in good shape on that side of the rubber. I am so EXCITED!!! I get to see DD throwing right out of the gate!! WAR EAGLE Davis!! I CANNOT WAIT UNTIL FRIDAY NIGHT!!!! Pretty excited about this rotation. Looks like Jack Owen will get the Tuesday start and I think either Carson Skipper or Will Morrison will get the Wednesday start. I have heard Brooks Fuller will likely factor into the backend as well. Some not so great news about the rotation. Davis Daniel left yesterday’a game after 2 innings with forearm tightness and will now have an MRI done and visit Dr. Andrews this week. I’d say the chances that he starts next weekend aren’t very good. Hopefully, it’s all precautionary and he can get back on the field soon.